As we ourselves age, so too do our parents. As adults we often find ourselves becoming the caretakers of others, paying back the loving dedication and care we received as children. Aging parents, however, can sometimes present unique challenges that you may not be equipped to handle. While caring for a loved one can be a rewarding and unique bonding experience for the “sandwich generation”, it can also become physically and emotionally demanding. When their care becomes too much for you to handle on your own, you do not necessarily need to turn to an assisted living or nursing facility to provide a safe environment for your loved one. In-home care can be a perfect solution to make sure their needs are met in the comfort of their own home. Here are four signs that you may need some extra help caring for an aging parent or loved one. Often one of the first difficulties of getting older is experiencing an increasingly difficult time just getting around. Going upstairs to bed or getting in and out of the shower can be a risk for tripping or falling, which can be even more dangerous if no one is there to help them up if it happens. Because such common, everyday tasks can become dangerous, you may feel the need to be physically present with your parent more frequently or worry that they may fall just going to the basement to do laundry. 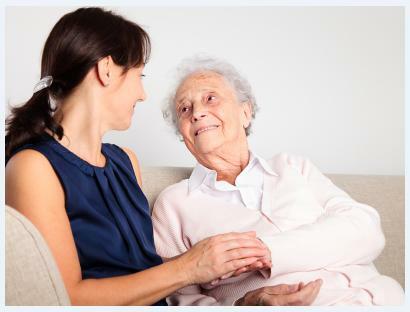 Home care provides another person to look out for your loved one to relieve some of these concerns. When a parent or loved one is recovering from a serious injury or illness, he or she may require extensive care. Making sure medications are taken, traveling to and from appointments, therapy, and getting proper rest can be overwhelming for an aging person to remember and monitor. These things can be stressful, not to mention time-consuming, for you to manage for them. An extra in-home caregiver can take over many of these duties to ensure your loved one is recovering successfully. Mental changes faced by aging adults, such as forgetfulness, dementia and Alzheimer’s, are perhaps even more challenging to deal with than physical problems. You would be understandably worried when mom, a famously good cook, suddenly forgets to turn off the oven, leaves spoiled food in the fridge, or forgets to eat meals at all. In-home care can help you keep an eye on your loved one’s daily affairs, making sure they’re eating, paying bills, and keeping their home in a safe, livable condition. Caring for an aging parent or loved one can become all-consuming. Monitoring medications, driving to doctors’ appointments, helping with personal care and feeding, and round-the-clock supervision can easily consume a lot of your time. This can be especially problematic when you have your own family and career to consider. If looking after an aging parent is detracting from your own health and quality of life, it may be time to consider hiring home health assistance. Deciding to hire a professional home health assistant to help care for an aging loved one is certainly not an abandonment of their care. To the contrary, their needs can often be met more safely by someone who is knowledgeable and trained to care for older adults. Having someone around to handle the bulk of the care also means your time spent with your loved one can be more focused on what really matters – spending quality time together that you can both enjoy. If you feel like it’s time to look into in-home care options for your parent or loved one contact us today to discuss our care solutions.